2 Bedroom Apartment To Rent in Derby for £850 per Calendar Month. Luxury Living in the heart of the city centre, located in the Cathedral Quarter! This newly converted, refurbished, renovated apartment is finished to an exceptional high standard throughout! The second floor apartment compromises of entrance hallway, a large Living/Kitchen area, two double bedrooms, family bathroom and en-suite. On entering the apartment is your second double bedroom on your right hand side. This room is 3.467m max x 3.114m max. Continuing further down the hallway from the entrance door, going down three steps is the master bedroom to the left, family bathroom directly in front and the open plan living, kitchen/dining area to the right. The huge master bedroom is complete with an half tiled en-suite including a pedestal wash basin, lowel level WC, towel radiator and a double shower pod complete with a rain dance shower. 5.442m x 4.384m plus bay window (0.752m). The second window is overlooking St Maryâ€™s Gate offering fabulous views of the Cathedral. The lower level family bathroom attracts a lot of natural light into deep Oriel frosted glass window. The three quarter tiled, family bathroom includes a pedestal wash basin, low level WC and a top of the range, slipper stand alone bath with shower attachments. The flooring is laid with grey, wood flooring. The size of the family bathroom is 3.191m x 2.42m max. The Living/Kitchen area is open plan with a superb, fitted, white gloss kitchen with a full kitchen set with AEG equipment including electric hob, single ovenand integral dishwasher, fridge freezer, washing machine, wall cabinets and boiler cupboard, part carpet, part wooden flooring. The kitchen also includes a three seater breakfast bar. The room has four windows including views of the Cathedral and the garden. The Living/Kitchen is 7.567m max x 3.592m. 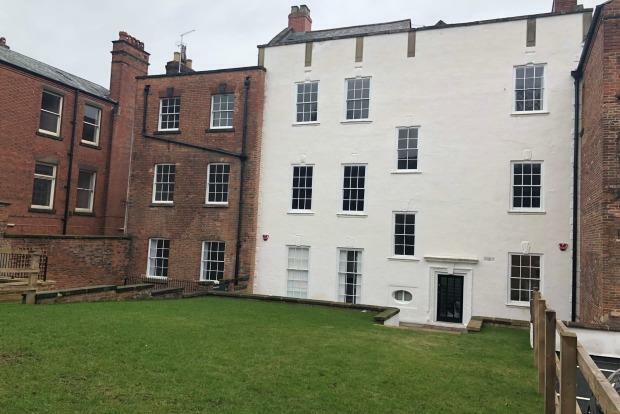 Use of communal gardens with patio area is to the rear of the property along with the car park with two designated car parking spaces through the electrically operated entrance gates to the site. The entire apartment is finished to a high specification, complete with the same monochrome decor and newly fitted grey carpets, with gas central heating (with new modern range radiators) and double glazing through out. Sockets throughout for TV, Satelite and Radio. Excellent Broadband connectivity. EPC is not applicable as Grade 2 Listed buildings are exempt. Be the first to live in this superb apartment! Available NOW.